My SMS to Meryl at the Race Office says “Carl in damse 20h50, out 4h00”. My plan to sleep till 5h00 took a turn for the worse when the wooden floors announced the movements of the early risers. I wasn’t going to fall asleep again so I got up and put myself onto auto-pilot. I ate well, again a good sign, got myself a nice cheese and tomato sarmie packed, filled the water bottles and saddled up. Leon and Dave had left just after 3h00 and Ingrid about 15 mins before me. The hard work on the previous 3 days had left a relatively “short” 88km into Willowmore for the last day. I was in good spirits and had worked out that the 88km was going to take me around 6 hours, 3 blocks of 2 hours each. The first two hours I’ll just enjoy the darkness until the sunrise around 6h00, the next 2 hours I’ll ride with some music, a two hour mix of seventies and eighties hits and the last 2 hours I’ll just enjoy the sights & surrounds of the Nuwekloof Pass as I head for home. Plan sorted. It wasn’t long before I saw Ingrid’s flashing red light in the distance and as I caught up to her, she promptly turned left down a reasonably prominent road but a decided turnoff. 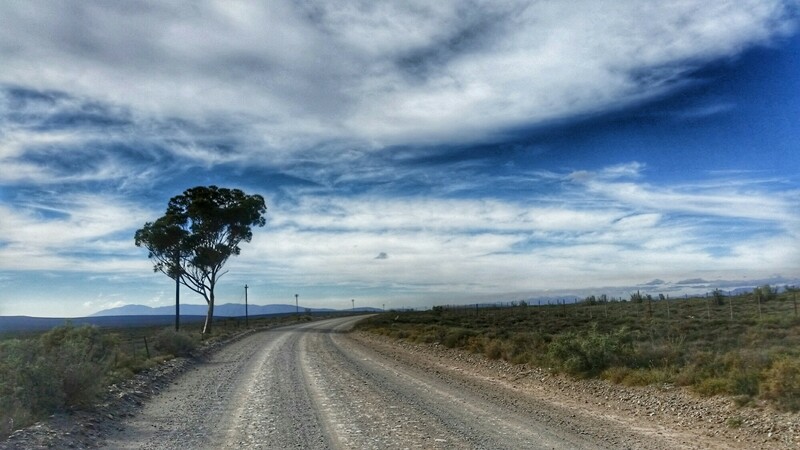 The road from Damse Drift to Willowmore is pretty much straight with not a single turnoff. I called her and we checked the narratives and map to be sure. We continued along the correct straight ahead road and made some small talk before we the distance between us opened up every so gently and eventually her lights disappeared behind me. Now this little dynamic may come across as rather ungentleman like. The Freedom Trail and its races have some unspoken arrangements which follow from the nature of the personalities that venture along the trail. Whilst most enjoy the company of others, most also are very comfortable riding and venturing out solo at odd hours. There is an acceptance that paths will intersect and that group will form for convenience and then will split up in an instant without discussion or deep consideration, feelings of guilt. Ingrid is one tough lady, she has a RASA blanket, has done several of the Freedom Series races solo and has got lost in forests on occasion. Her gentle demeanor and friendly smile hides a lean mean self-sufficient riding machine. She was content to ride at her pace and in her world as much as I was mine. It wasn’t too long until the dark sky started developing some coloring, first gentle and then increasingly pastel filled color until the sun bursts out and illuminates the world as much as starts heating it up. I love this experience and it always fills me with energy and lifts my spirits. I had planned to find some water along the way but the cooler night temperature meant my water was good to last the way. The morning light was the first light of the Baviaans since we had left the reserve gate the previous evening. 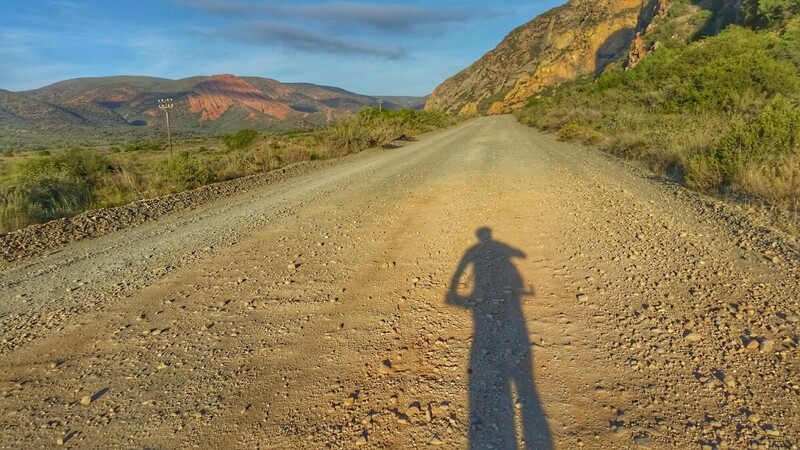 I had ridden almost all the way through the Baviaanskloof without seeing any of its beauty. 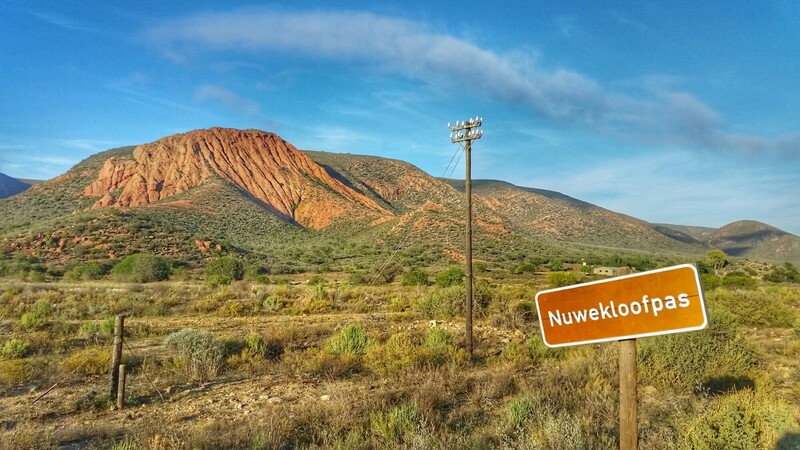 Luckily I had a bit left and the rising light lit up the the Kloof around me with its red rock formations forming a stunning backdrop. I reached the site of a tree house site just as the light came through, we had been the first guests to stay here many years ago. 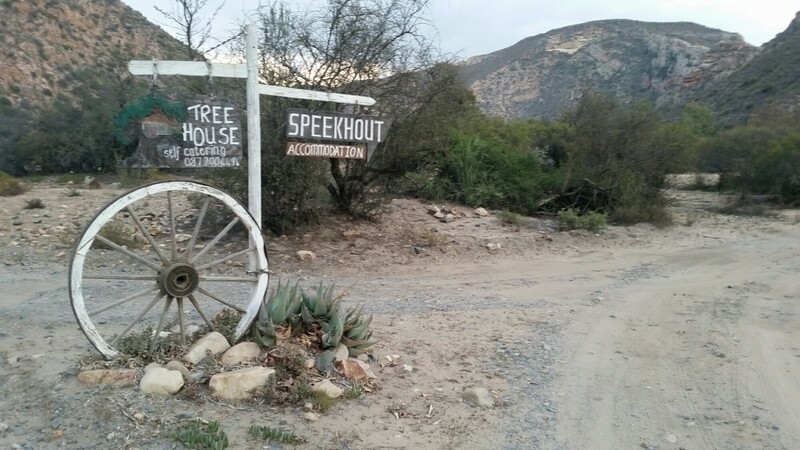 Around the next corner was Makadaat Caves and Info centre, it seemed quiet at 7h00 so I rode past. In the mean time the iPod music was superb, I was singing Alice and Major Tom at the top of my voice, it was like a very enjoyable Saturday morning ride, it was in fact Saturday. I still had no signal and was ahead of schedule so wanted to let my wife know that I would be in Willowmore around 10h00, a few hours ahead of schedule. They wanted to be at the finish to welcome me but were en route the Langkloof from St Francis. I thought maybe I’ll get a signal at the top of the Nuwekloof Pass, the last sting in the tail of the this riding section before Willowmore. It was around 8h00 cause Alice and Major Tom repeated for the second time in my ears (2 hours from 6h00 when I started the iPod as per my schedule). There’s a lesson in here for myself and other long distance riders. Progress is slow and looking at the odo meter and time can be mentally and emotionally draining. Any distractions for the mind are most welcome and can make long boring stretches a bit more interesting and tolerable. After a really breathtaking ride through the Nuwekloof Pass I eventually reached the top of a high mountain where I could call my wife and inform her of my estimated arrival time. They were a bit tight for time but were already on the way. I was looking forward to seeing the very underwhelming welcoming party in the street in Willowmore. It would probably be the very recognizable figures of Meryl and Glenn and my wife and her sister, who had kept her company while I was out on my adventure. I was no there yet and after a little picnic of cold water and a cheese sarmie I saddled up for the last 30km. It was an enjoyable ride and Alice and Major Tom had not repeated for a third time yet. 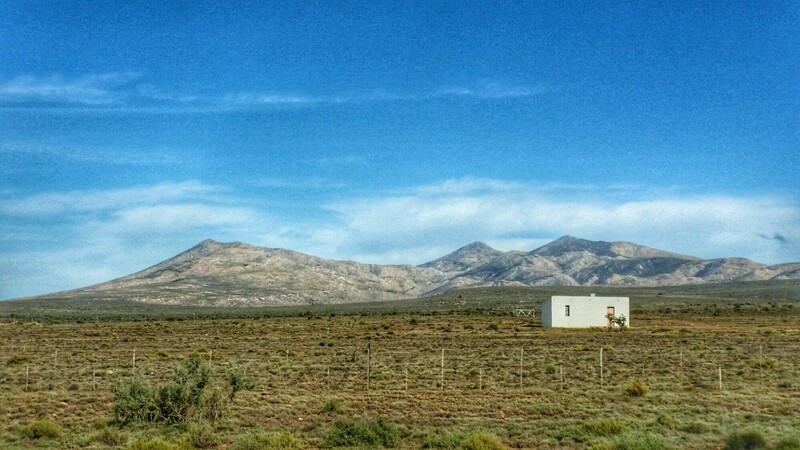 For the first time in days the scenery changed from mountains to more Karoo flat land again and presented some very pretty photo opportunities. In an amazing coincidence I reached the last 3km tar road at the exact moment my wife and her sister cam speeding by towards Willowmore. When I noticed them, I naturally got out the saddle, pumped the pedals and rode like I was time trailing the Tour de France. They raced off the prepare the finish line procedures whilst I could sit up again and slow down to a more responsible riding speed and take in the scenes of Willowmore ahead in the distance. I generally find the final hour before the finish of these ultra rides an emotional period as I take time to reflect on the highs and the lows of the journey and this time it has been no different. During my incredibly hard second day there were times that I did not think I would be able to finish the race but the fear of failure and knowing that it was within my abilities no matter how hard kept me going and from that moment on I never had negative thought again and my riding became more enjoyable. I had made new friends, some amazing and special new memories and I was going to finish. I had been blessed beyond my wildest dreams. I rode into Willowmore feeling like a champion. I double checked my right turn and rode up to the Willows. In the distance I saw the expected underwhelming reception party, the familiar figures and the finish line of Race to Willowmore. There is no finish setting that would be appropriate and deserving to celebrate the special experience of this race and it ends as low key as it starts and we prefer it this way. The real riding experiences and trail and tribulations are had out on the trail but what makes this reception party special is that these are the people who accompany us in the background as they watch over and support us kilometer for kilometer of our journey. Its a special moment when we see each other again and the hugs, smiles and chirps complete a perfect ending. Thank you to everyone who made this adventure possible, I have been truly blessed. This entry was posted in Cycling, Ride Reports and tagged Freedom Challenge, Race to Willowmore by trackz11. Bookmark the permalink.